Point of a Million Connections: Only 30 Chances to Get it Right? Only 30 Chances to Get it Right? Last Saturday, I saw the film To Make a Farm. It follows five young small farmers through the 2010 growing season. The director, who was present for the screening, said he originally thought he was setting out to make a depressing film about the end of farming, but it ended up being very hopeful. "If I farm for 30 years, I'll only have grown potatoes 30 times." Unlike musicians who can practice a piece hundreds of times, or even high school teachers who could teach the same course over a hundred times in a career, farmers get only a few chances to learn from their experiences and to fix mistakes. Especially if the farmers do not have a family farm background, as none of the young people in the film did. 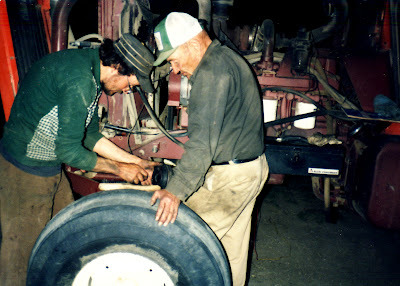 My dad and grandpa, in the 80s, conferring over machinery repairs. My grandpa lived to be seventy-five. He probably grew wheat 60 times, because he grew up on a farm. But that's not all. He also had his father's memories, and possibly his grandfather's memories, to tap into, and their memories of neighbour's growing seasons. That was an invaluable resource for my dad, and my brother. Regardless of how plant varieties and equipment change throughout the years, the past offers lessons for everyone. The internet has a multitude of farming forums to participate in, but those other farmers don't know your land intimately. I admire those young urbanites who are succeeding at farming, but I wish it could be easier for them - and intergenerational transfer of knowledge would make it easier. With the demise of the Canadian Wheat Board, some bright young guys are thinking of ways to cash in. Just the other day, an acquaintance came up with the concept of a Wheat Pool whereby farmers could come together to sell their wheat. Yes, the same voluntary pool that didn't work in 1931 and morphed into an elevator company. Our ancestors had to learn to appreciate trees during the Dirty Thirties, and we may have to come to the same realization with the wild swings in spring weather we've been experiencing in the past few years. And the best way to learn - as with languages, values, and swimming - is through immersion as early as possible in life. We need intergenerational family farms.